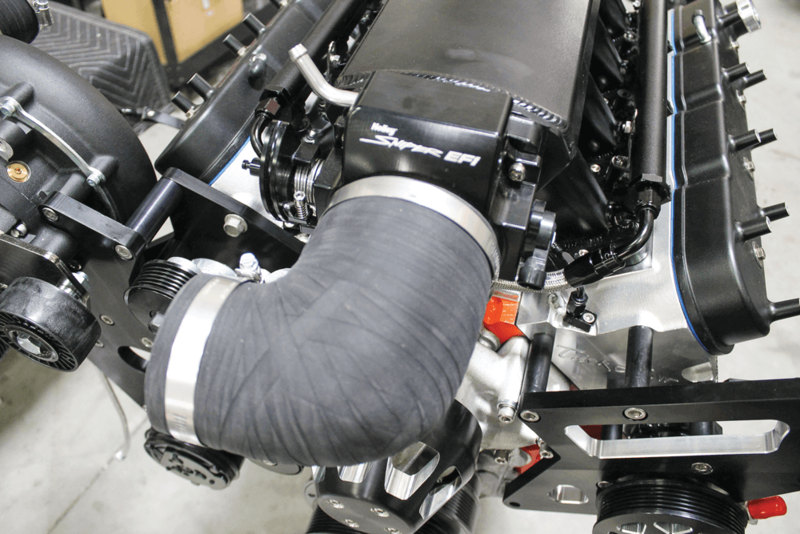 It’s no secret that LS engines have become the go-to choice for engine swaps. 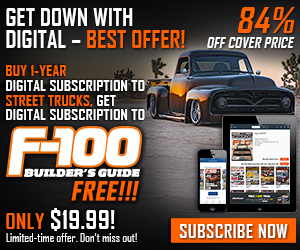 Because of their popularity, aftermarket companies of all sorts have developed many products that not only make the swaps easier, but they also enhance performance. 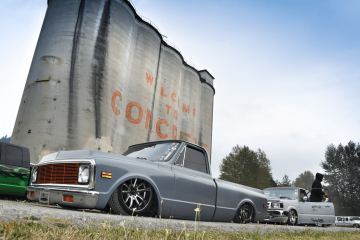 All American Billet has been cranking out these types of setups for some time now, and it offers a lot of different setups for more than just the LS engines. 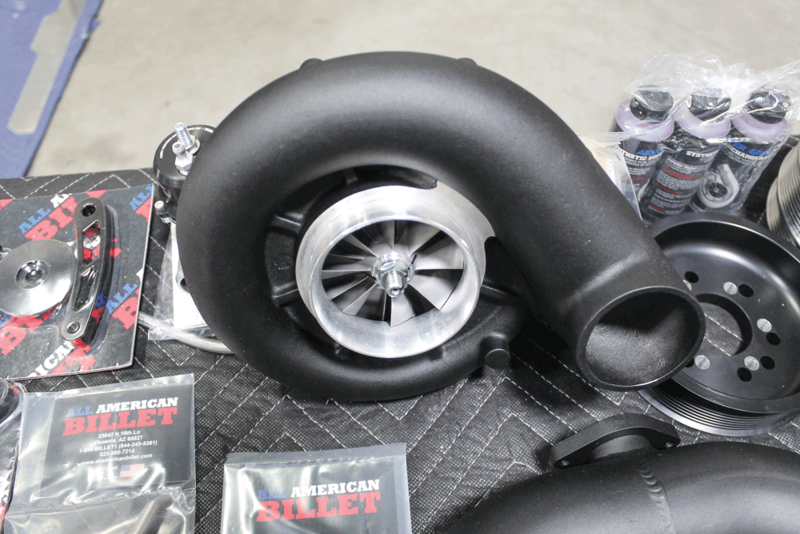 In fact, All American Billet makes a ton of parts to dress up your engine and the rest of your truck. 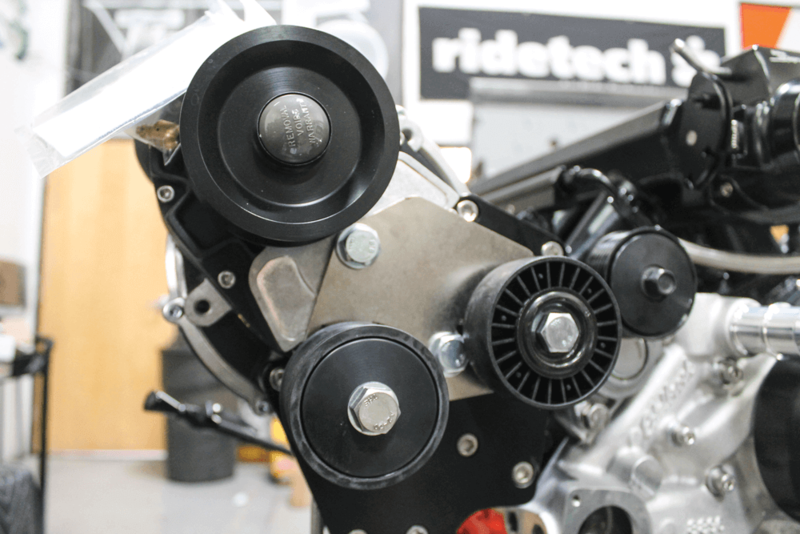 We reached out to the company to help us address our engine’s pulley setup, and the crew recommended one of their brand-new systems. The fresh gear included something most pulley setups don’t normally have, a supercharger. 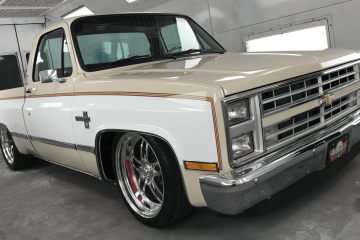 Vortech Superchargers and All American Billet teamed up to create an all new front-drive setup that includes one of Vortech’s V3-Si centrifugal blowers. 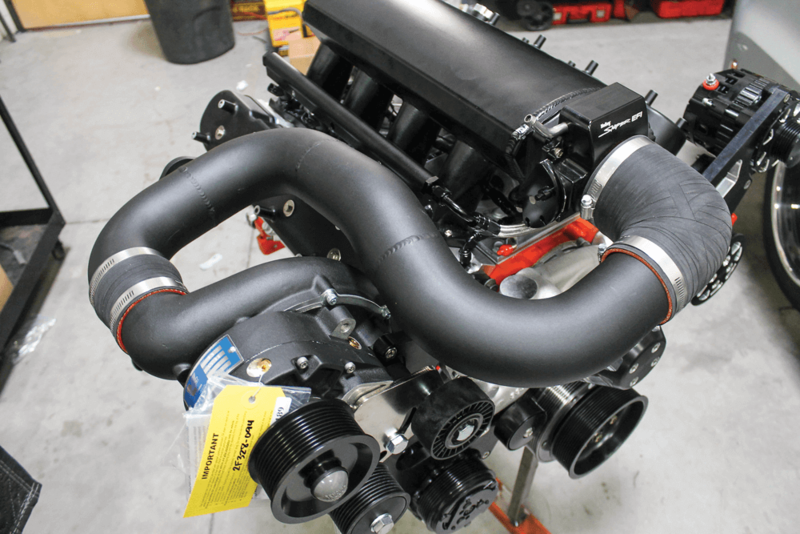 This supercharger is capable of increasing rotational force to 775 hp with 26 psi of boost. We don’t plan to get that crazy with our engine, but it’s nice to know that the efficiency is there if we want it. 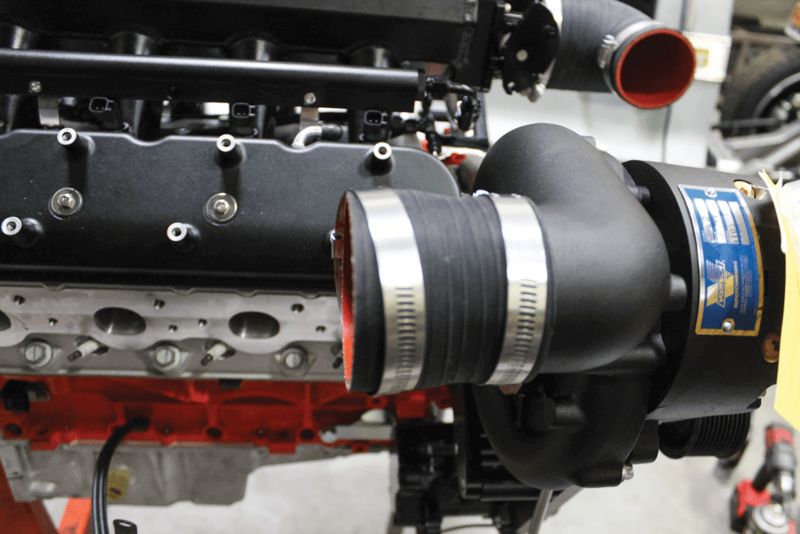 The blower setup, combined with our pulley kit and engine specs, should deliver around 8 psi of boost. 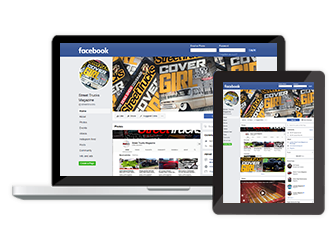 Because the supercharger is a part of the pulley kit, everything included is bolt-on; so, the complete system can be installed relatively easily by most garage weekend warriors. 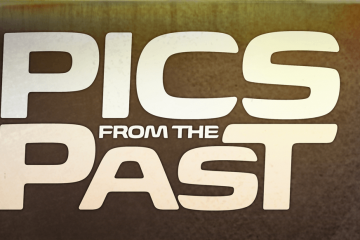 We’ll cover some of the specifics in the following photos. 1. 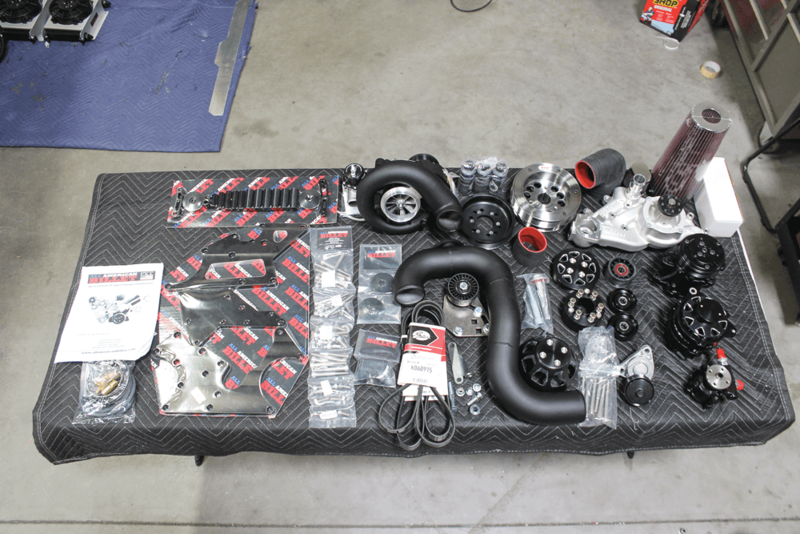 Here are all of the parts included with the All American Billet LS Vortech Silverline supercharger kit (P/N FDS-LSV-201). The kit is available in three finishes: raw aluminum, polished aluminum and the Silverline series, which is black anodized with machined accents. 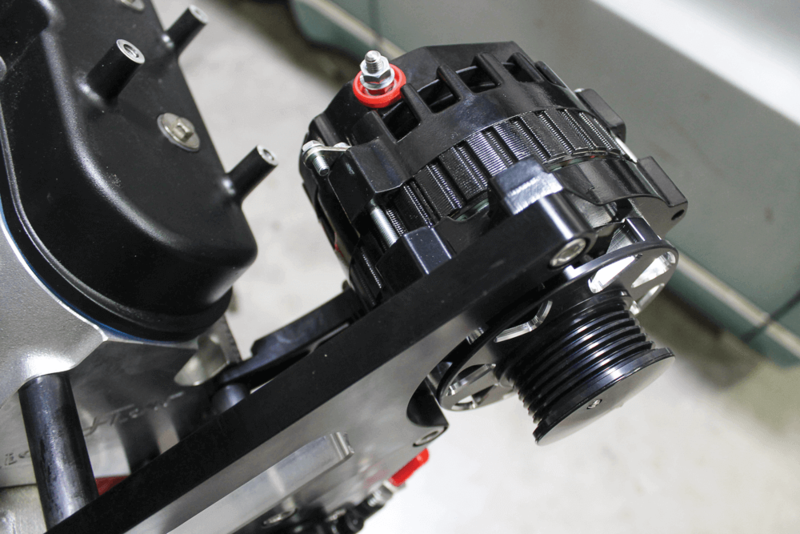 We chose the SIlverline option to match the rest of the black anodized and powder-coated parts of our engine. 2. 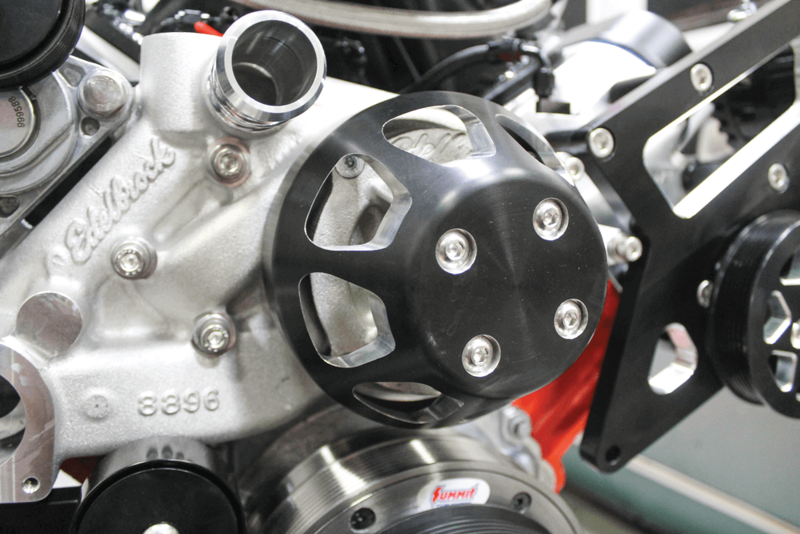 At the heart of the new kit is this Vortech V3-Si blower. This supercharger is extremely efficient at 78%. It is also a self-lubricating unit, so there’s no need to run oil lines to or from it. It also features helical-cut gears for quieter operation and a 3.61:1 ratio. 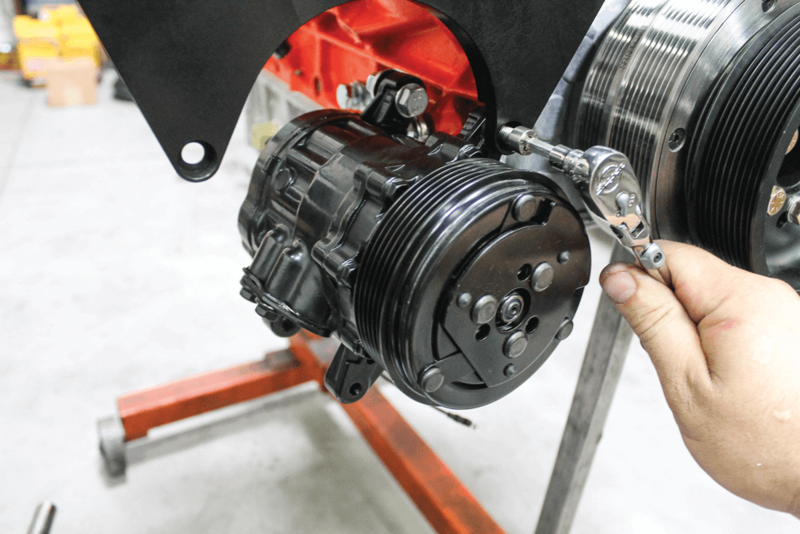 3.The All American Billet kits come with Tuff Stuff Performance accessories, and this particular kit includes a black powder-coated alternator, power steering pump and AC compressor. 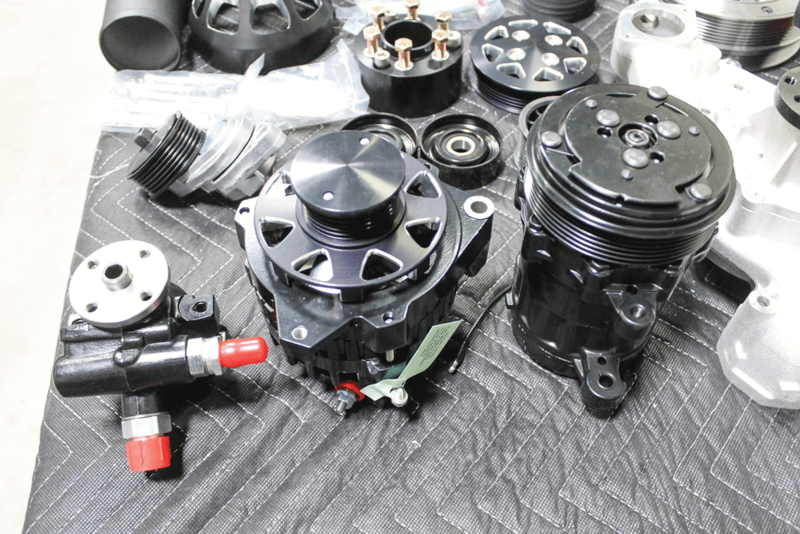 The alternator comes with the anodized aluminum pulley already installed. 4. Our first step was to get the supplied balancer installed on the crankshaft. 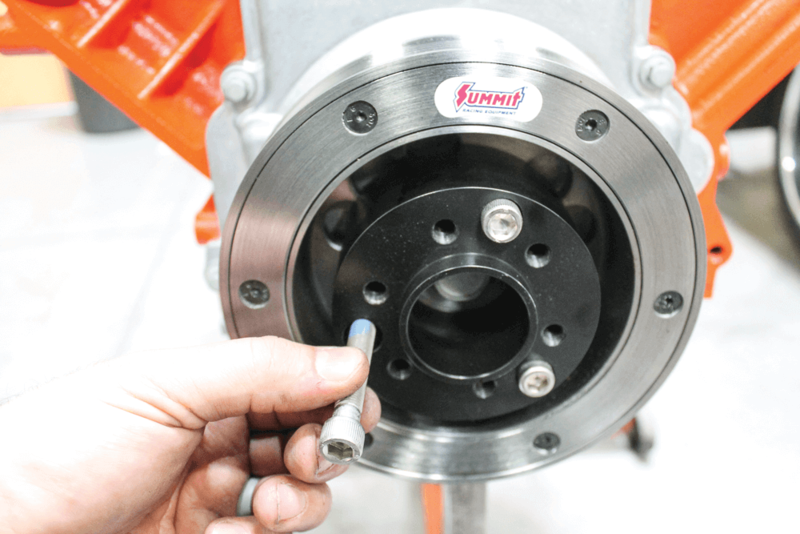 We used an installer tool for the Summit Racing balancer. Obviously, if you have a stock balancer installed on your engine, that would have to be removed first. 5.The balancers on the LS engines are press-on and don’t have any kind of spline or key to keep them from spinning under the load of a belt-driven supercharger. 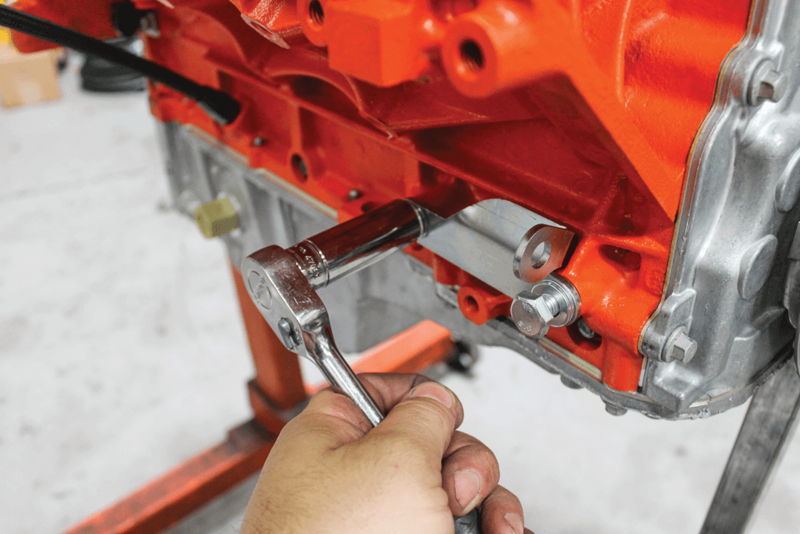 To prevent any slipping of the balancer on the crankshaft, a dowel pin needs to be installed. 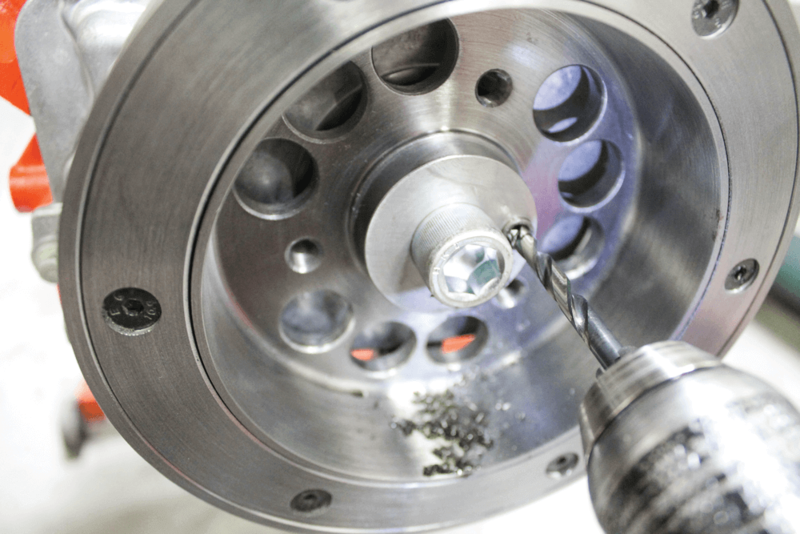 A temporary crankshaft bolt and a guide for drilling into the crank and balancer are included in the kit. The pin slides into the notches left by the drill bit and will make sure these two pieces never slip. 6. A new crankshaft bolt was installed and torqued to spec. 7. We installed a spacer to accommodate the new crankshaft pulley, which will drive the supercharger. 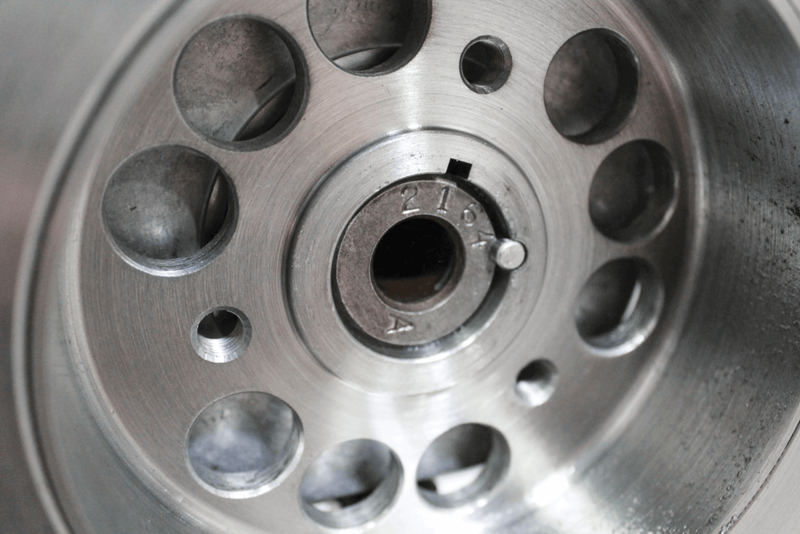 The spacer was installed using stainless Allen head bolts that sit flush with the spacer’s face. 8.The 10-rib crankshaft pulley was next. We used grade 8 hardware and also applied blue thread locker to the bolts to make sure they don’t back out. 9. On this pulley setup, the AC compressor mounts low on the passenger side of the engine. 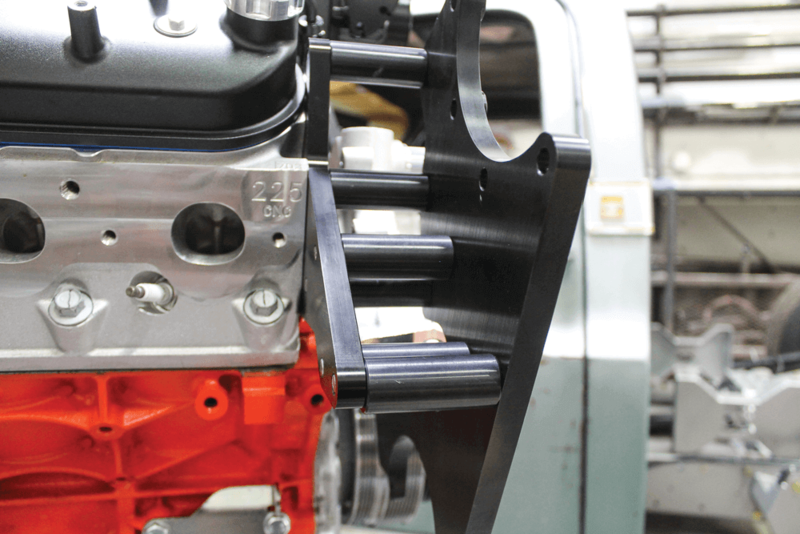 In order to hold the compressor as tight to the engine block as possible, this bracket was designed to actually sit inside of the block’s casting ribs. 10. 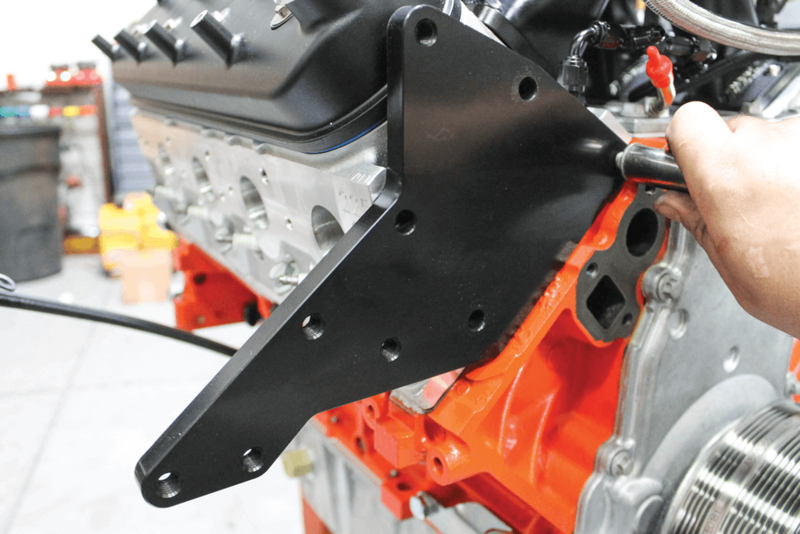 Unlike All American Billets’ standard LS kit, the brackets on this one mount directly to the engine heads. Using the supplied hardware, we bolted up the first bracket to the Trick Flow head. 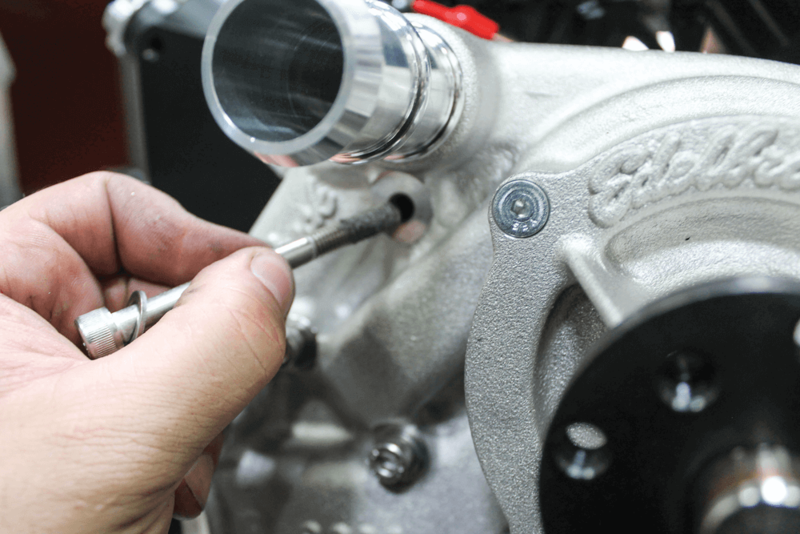 11.An Edelbrock water pump is also supplied with this system and is installed using the stainless hardware provided in the kit. 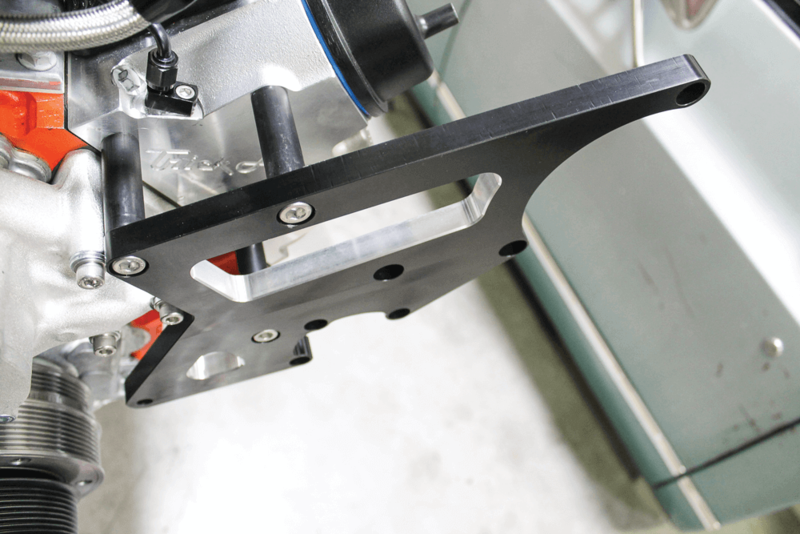 12.Installing the driver’s side bracket requires the use of some spacers. All American Billet provides the correct length spacers, which are also black anodized to match. 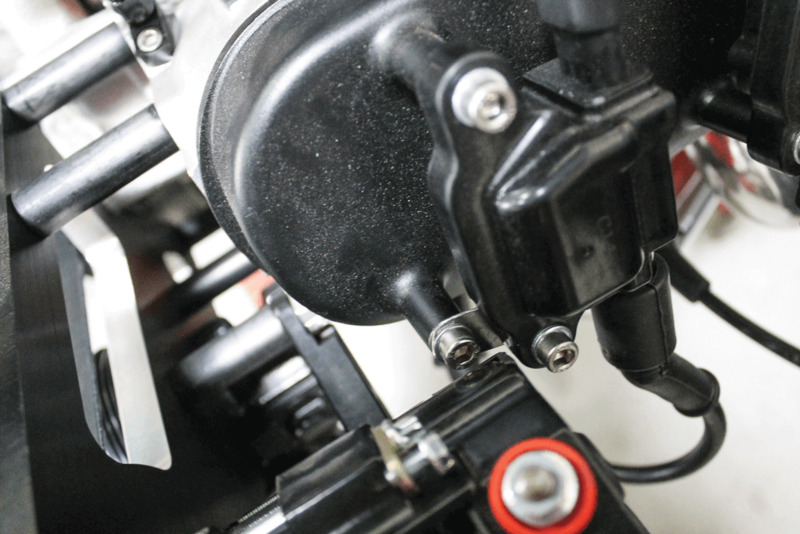 13.The first actual component of the system to be installed was the power steering pump. This is a pretty typical Type II power-steering pump. 14.The 160-amp one-wire alternator is next. It was held in place with more stainless hardware. Notice the attention to detail that All American Billet designs into its kits. 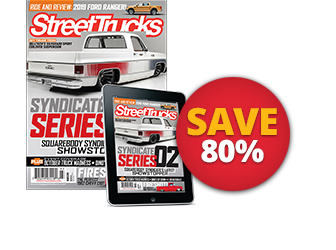 Flush bolts and the correct clocking of the alternator make attaching the wire easy. 15.For extra support, this aluminum bracket secures to the back of the alternator. 16. A final bracket was installed on the passenger side using the provided hardware and spacers. Again, notice the attention to detail with the anodized spacers and flush stainless bolts. Another item to note is that we are making sure to use anti-seize on all of the stainless hardware. 17.The black powder-coated AC compressor is attached to the bottom of the bracket that we installed along with the first smaller bracket. 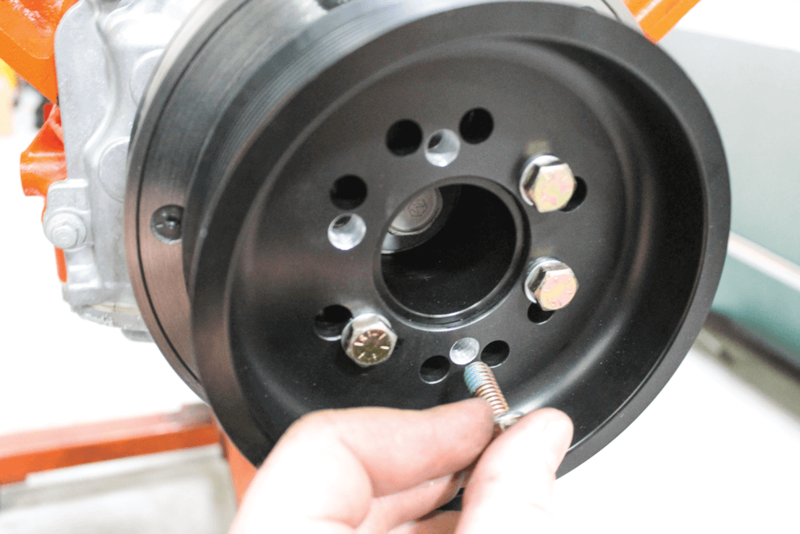 18.There are a few different idler pulleys included with the kit, along with the specific spacers used with them. We paid close attention to the instructions to ensure we installed the correct ones in the proper locations. 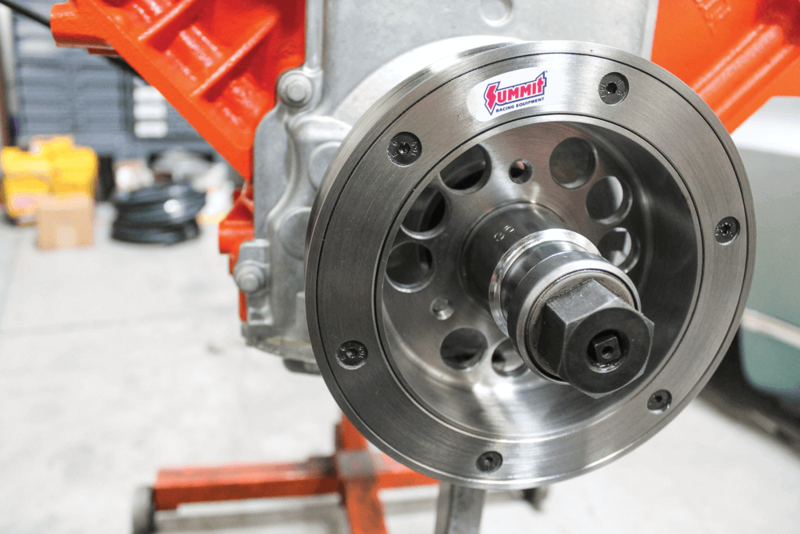 The idlers aren’t just a standard pulley either, they are machined by All American Billet and include upgraded bearings and a neat cover to keep them looking sharp. 19.Once the idler pulley was assembled correctly, we installed it in the correct location. The belt for all of the components, except for the actual supercharger, will ride on this idler pulley. 20.A factory GM tensioner is also included in the kit, and All American Billet didn’t neglect to dress up this component either. 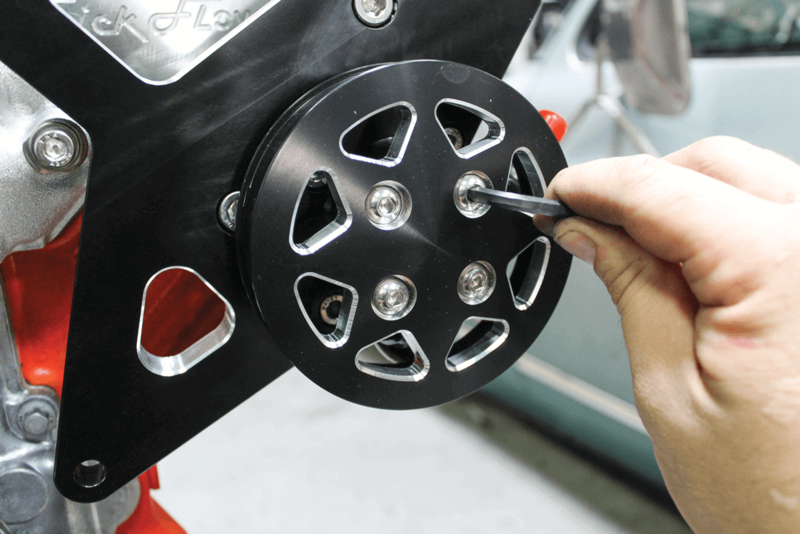 A black anodized billet aluminum cover goes over the billet aluminum pulley. 21. 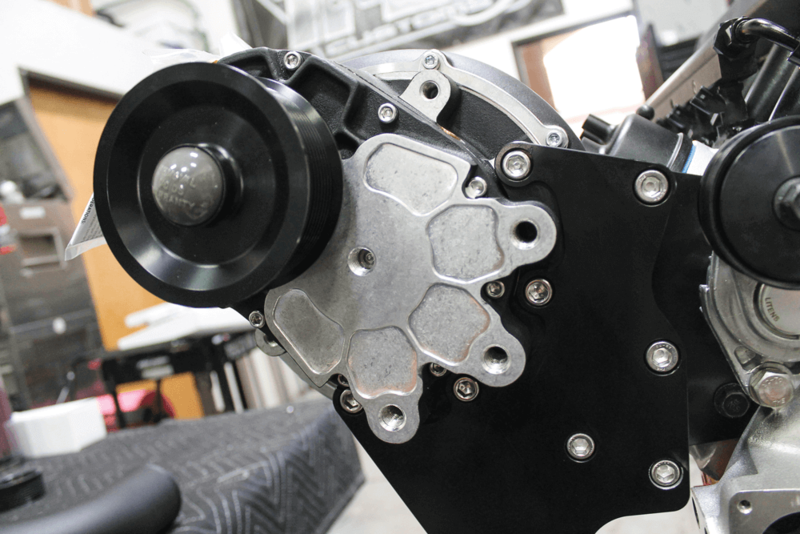 A few more billet parts were installed, starting with the power-steering pulley. 22.The water-pump pulley was installed as well. These pulleys undergo several machining steps to get the Silverline treatment. 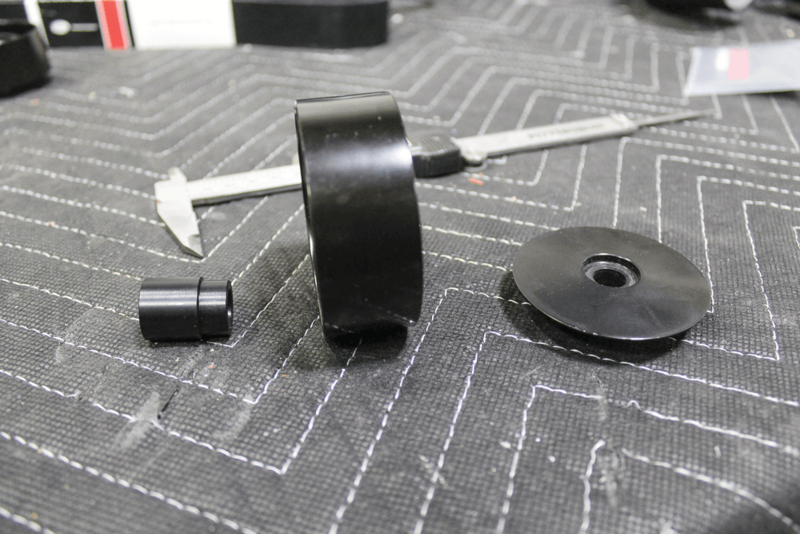 First, they are machined to get the shape and cut-outs, then they are coated with black anodizing, and finally they are machined one more time to highlight the pulley windows. 23.An important part of the system, and the part that makes this kit special, is installed next. The supercharger isn’t a lightweight object, so several bolts secure it to both the front and rear brackets that were previously installed. 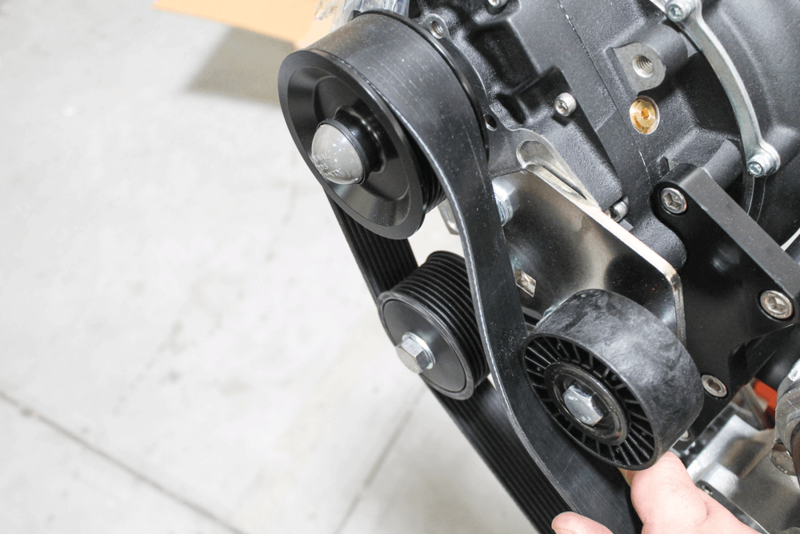 24.This bracket keeps the 10-rib supercharger belt from slipping; it holds an idler pulley and a tensioner pulley. 25. 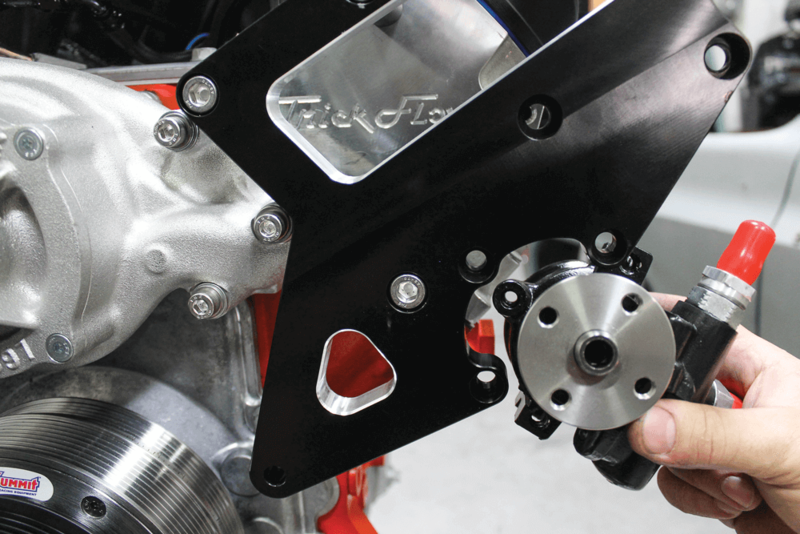 With all of the components installed on the front of the engine, we can connect the throttle body inlet to the supercharger outlet. 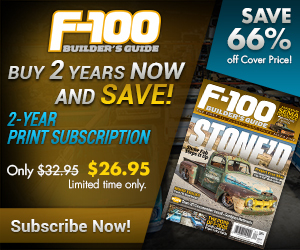 Included with the complete kit are several silicon couplers and an aluminum intake tube. We began the assembly by installing the 90-degree coupling at the throttle body. 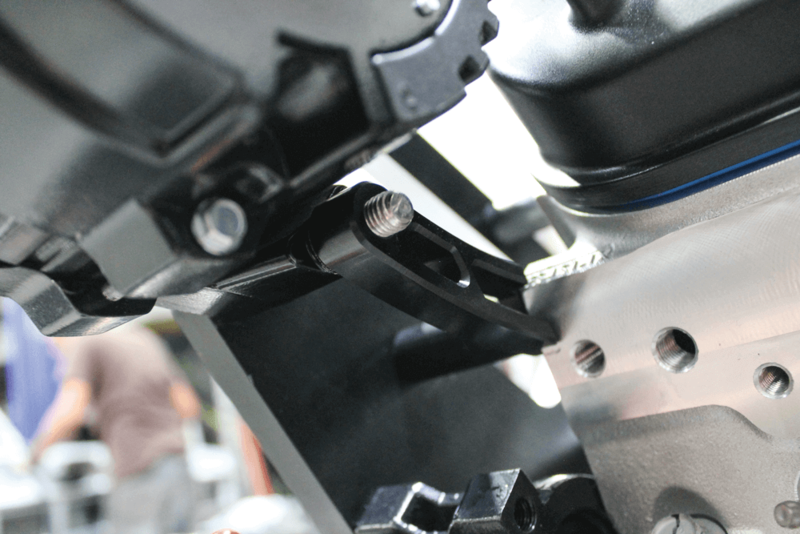 26.Next, the straight coupling at the outlet of the supercharger was installed. 27. 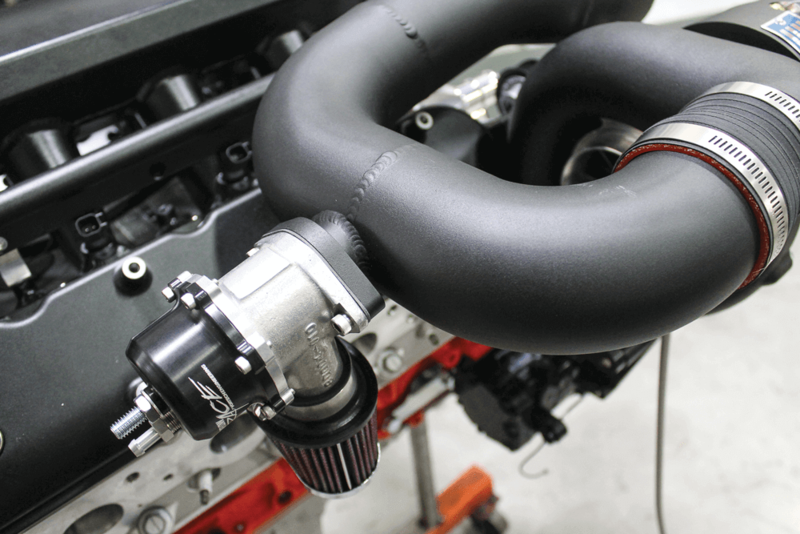 This powder-coated aluminum intake tube connects the two together. We left all of the hose clamps loose until we had this piece installed in both ends. Once we had it positioned, the hose clamps on the couplers were tightened to hold it where we wanted it. 28.An important part of any forced induction system is the bypass valve or blow-off valve. 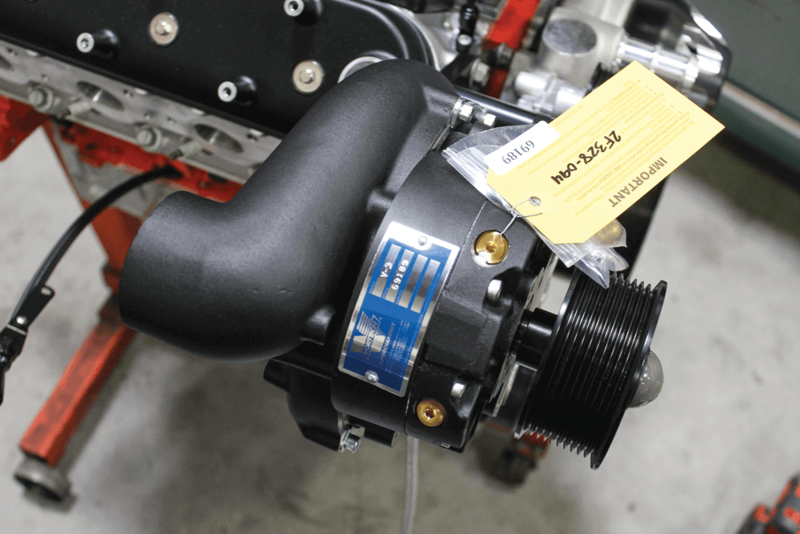 All American Billet provides this Vortech Maxflow Race bypass valve with a filter, which attaches to the intake tube. 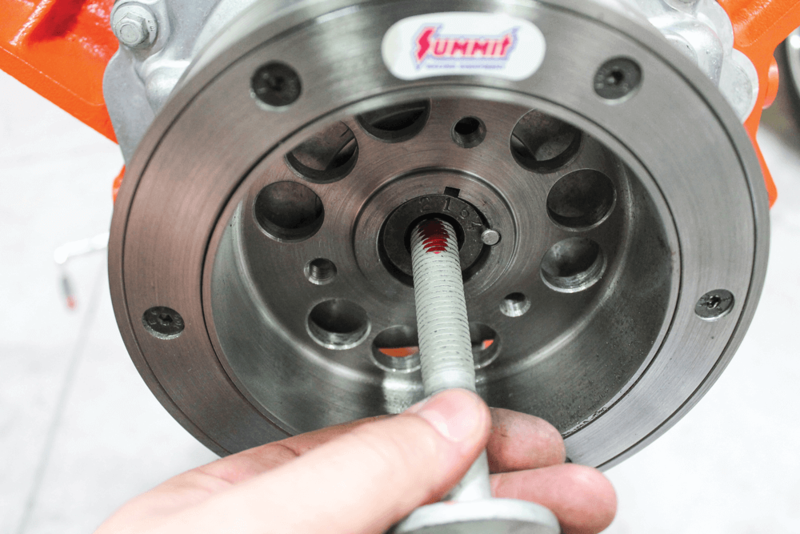 The tube is outfitted with a flange for the bypass valve, making the installation as easy as attaching the two stainless bolts. 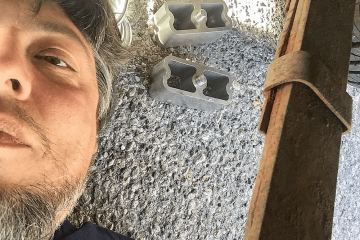 29.The last steps involve the drive belts. 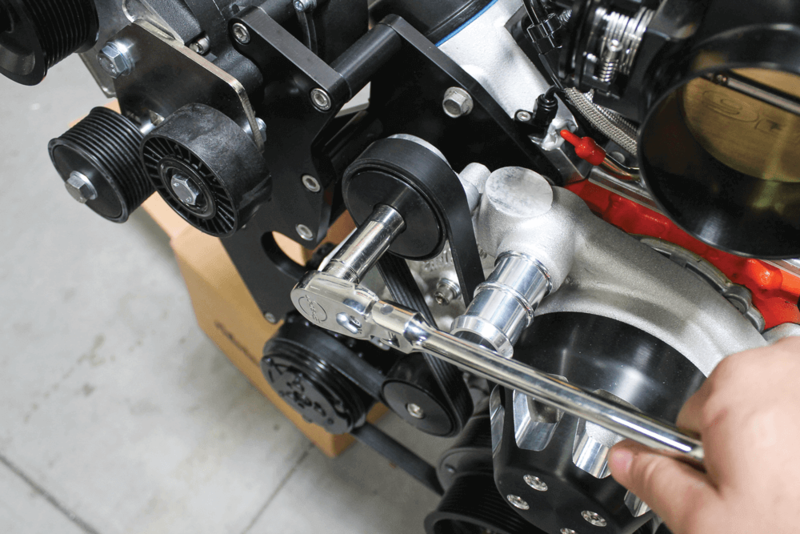 The serpentine belt that connect the crankshaft to the accessories must be installed first. Using a 15mm socket on a ratchet, we released the tension so that we could route the belt around the accessories and pulleys. 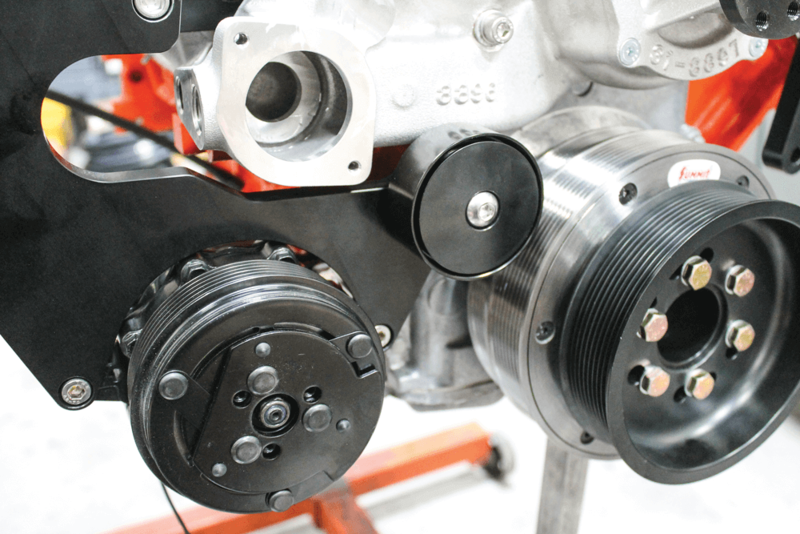 30.A 10-rib belt is provided in the kit for use with the supercharger specifically. The tensioner is manual and must be set tight enough so that the belt doesn’t slip or else we’d lose some boost under higher loads and rpms. 31. 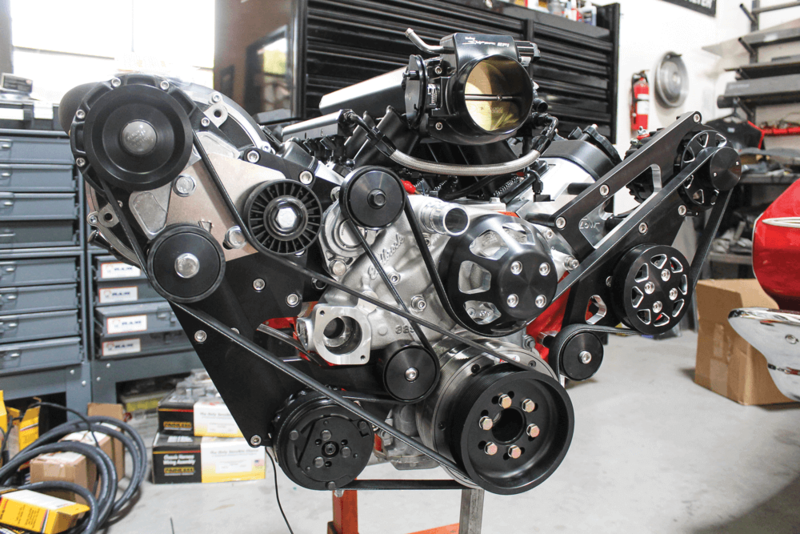 Here’s a good look at the front of the engine with all of the All American Billet parts installed. It sure is nice to be able to install all of these components with the engine removed from the truck, but it is still very possible to do with the engine in place. 32. We use taller-than-stock valve covers on our engine, so we had to get creative. We swapped the driver’s side covers to the passenger’s side, and vice versa, so that our oil filler cap would clear. Then we made a quick tab to rotate the coil backwards a bit. 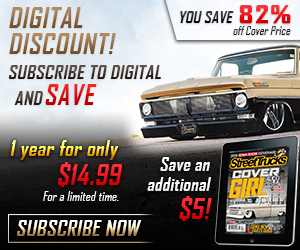 If you are running stock valve covers, this won’t be an issue. 33.Here it is—all set to be installed in the truck. 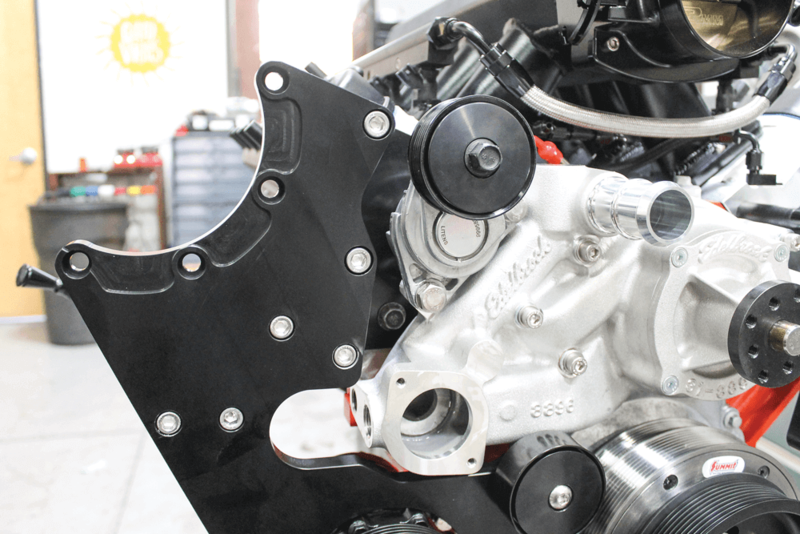 This combination of parts from Summit Racing, All American Billet, Trick Flow, Vortech and Tuff Stuff should put us somewhere around 650 hp at the crankshaft. Previous ArticleBEHIND THE SCENES AT SIKNIC 2019!